, a late very learned divine, was the eldest son of the rev. John Townson, M. A. rector of Much Lees, in Essex. He was born in 1715; and, having been instructed a-while by his father, was placed under the rev. Henry Nott, vicar of the neighbouring parish of Terling, where he was soon distinguished for quickness of apprehension and a most retentive memory. 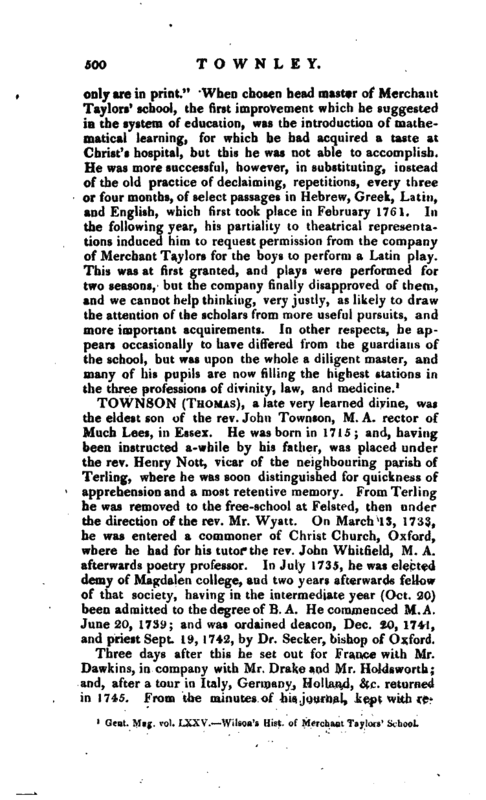 From Terling he was removed to the free-school at Felstod, then under the direction of the rev. Mr. Wyatt. 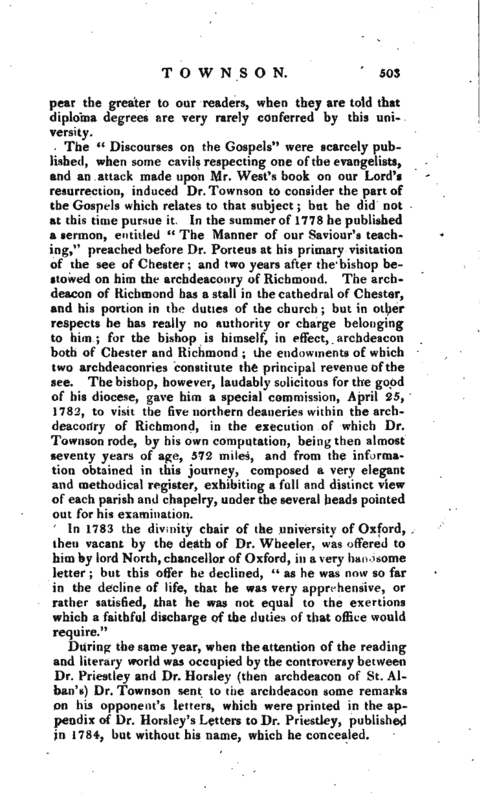 On March 13, 1733, he was entered a commoner of Christ Church, Oxford, where he had for his tutor the rev. John Whitfield, M. A. afterwards poetry professor. In July 1735, he was elected demy of Magdalen college, and two years afterwards fellow of that society, having in the intermediate year (Oct. 20) been admitted to the degree of B. A. He commenced M.A, June 20, 1739; and was ordained deacon, Dec. 20, 1741, and priest Sept. 19, 1742, by Dr. Seeker, bishop of Oxford. Three days after this he set out for France with Mr. Dawkins, in company with Mr. Drake and Mr. Holdsworth; and, after a tour in Italy, Germany, Holland, &c. returned in 1745. From tue minutes of his journal, kept with | regularity and marked with intelligence, an agreeable volume might easily have been formed, had he been disposed to attempt it. But of the accuracy of such books of travels as are usually given to the public from a transient view of a country, he entertained no very favourable opinion; in support of which he occasionally related the following anecdote of his friend and fellow-traveller, Mr. Holdsworth. When this gentleman first went into Italy he composed with some care an account of what he saw. On visiting the same country again, with his former journal in his hand, he altered the narrative, and contracted the substance of it. When he made the tour a third time, he burnt his papers. On his return to college he resumed the employment of tutor. Mr. Lovibond, the poet, and lord Bagot, were two of his pupils. In 1746 he was presented to the living of Hatfield Peverel, in Essex. In 1749 he was senior proctor of the university; and, resigning Hatfield, was presented to the rectory of Blithfield, in Staffordshire, by sir Walter Wagstaffe Bagot, bart. Soon after he quitted the proctorship he was admitted (June 15) to the degree of B. D. and the same summer Mr. Drake offered him the lower rnediety of Malpas, in the county of Chester. After some reluctance, principally arising from his unwillingness to leave Oxford, he accepted this offer, and was instituted Jan. 2, 1751. At the close of the year (Dec. 19) he quitted Oxford, and resigned his fellowship the month following. He now divided his time between Malpas and Blithfield, which he held for a few years with his new preferment; and then, having resigned it, he inducted (Feb. 23, 1759) his worthy successor, the rev. Walter Bagot, M. A. son of his esteemed friend and patron. In 1758, a very considerable accession of fortune came to him by the death of the rev. William Barcroft, rector of Fairsted and vicar of Kelvedon, in Essex, who bequeathed him his library and the principal part of his fortune, amounting in the whole to more than eight thousand pounds. According to the testimony of his biographer, his conduct as a Christian‘ pastor seems to have been in all respects most exemplary. About 1766, and for some time afterwards, he employed himself in composing an exposition of the Apocalypse. This he finished, but never published. “It was his humble request to God, that if his system were wrong, the work might never see the light) and it so proved, that | whenever he thought of revising his papers and preparing them for the press, something still intervened, and hindered his design.” In this uncertainty, as to the probable success of his undertaking, it was suffered to lie quiet in his stiKlv, with a direction to be burnt, whicji he never rescinded. 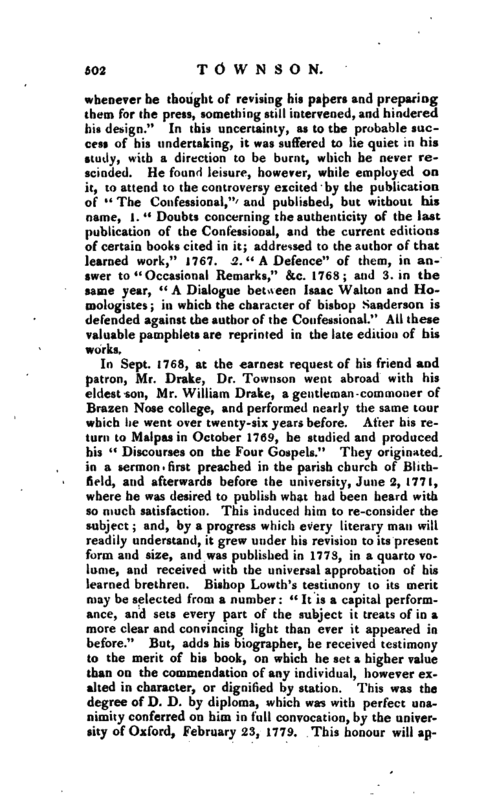 He found leisure, however, while employed on it, to attend to the controversy excited by the publication of 4 * The Confessional,“and published, but without his name, 1.” Doubts concerning the authenticity of the 1 last publication of the Confessional, and the current editions of certain books cited in it; addressed to the author of that learned work,“1767. 2.” A Defence“of them, in answer to” Occasional Remarks,“&c. 1768; and 3. in the same year,” A Dialogue between Isaac Walton and Homologistes; in which the character of bishop Sanderson is defended against the author of the Confessional." All these valuable pamphlets are reprinted in the late edition of his works. 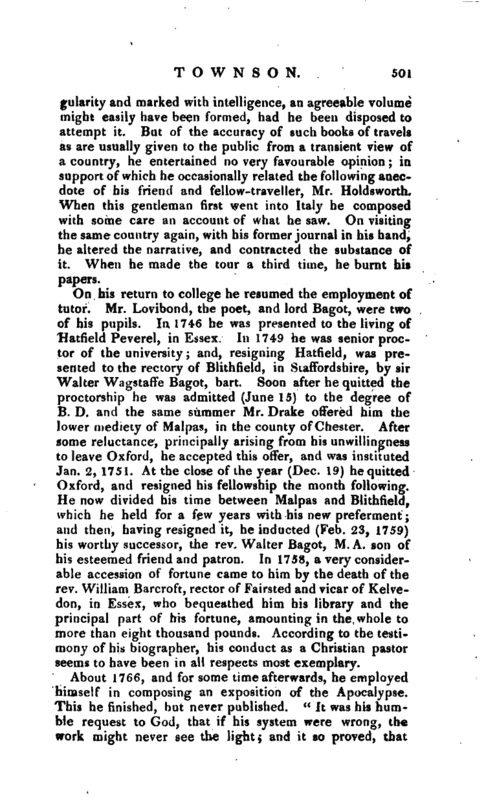 In Sept. 1768, at the earnest request of his friend and patron, Mr. Drake, Dr. Townson went abroad with his eldest son, Mr. William Drake, a gentleman-commoner of Brazen Nose college, and performed nearly the same tour which he went over twenty-six years before. After his return to Malpas in October 1769, he studied and produced his “Discourses on the Four Gospels.” They originated in a sermon first preached in the parish church of Biithfiold, and afterwards before the university, June 2, 1771, where he was desired to publish what had been heard with so much satisfaction. This induced him to re-consider the subject; and, by a progress which every literary man will readily understand, it grew under his revision to its present form and size, and was published in 1778, in a quarto volume, and received with the universal approbation of his learned brethren. 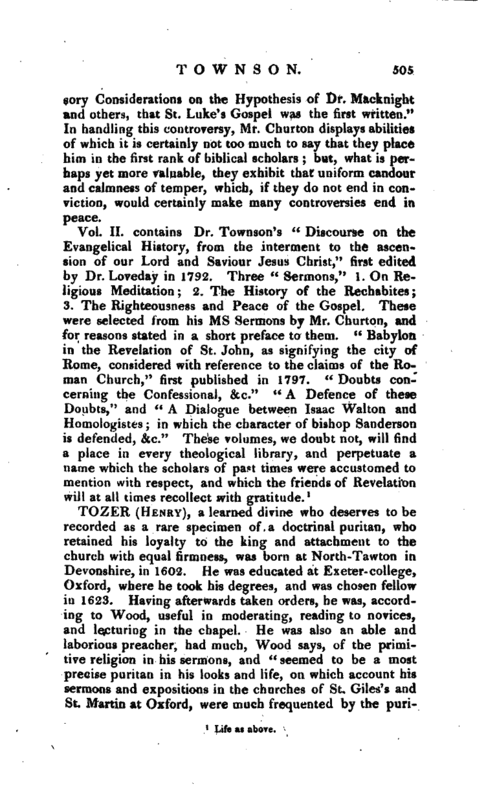 Bishop Lowth’s testimony to its merit may be selected from a number: “It is a capital performance, and sets every part of the subject it treats of in a more clear and convincing light than ever it appeared in before.” But, adds his biographer, he received testimony to the merit of his book, on which he set a higher value than on the commendation of any individual, however exalted in character, or dignified by station. This was the degree of D. D. by diploma, which was with perfect unanimity conferred on him in full convocation, by the university of Oxford, February 23, 1779. This honour will | appear the greater to our readers, when they are told that diploma degrees are very rarely conferred by this university. 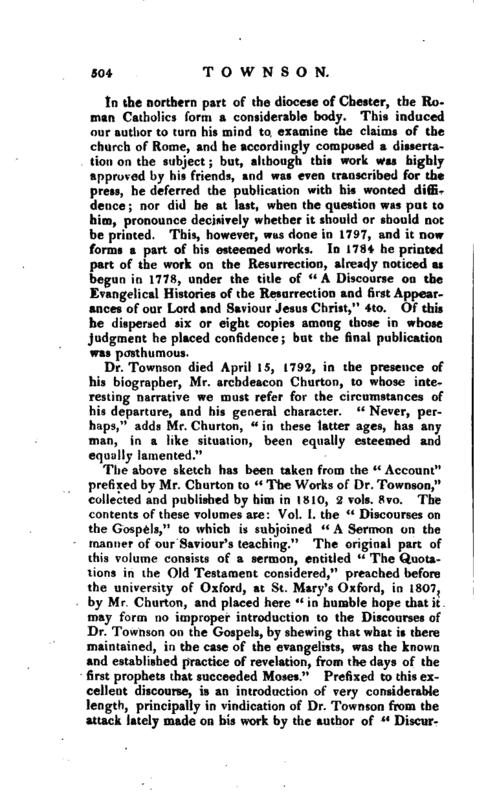 The “Discourses on the Gospels” were scarcely published, when some cavils respecting one of the evangelists, and an attack made upon Mr. West’s book on our Lord’s resurrection, induced Dr. Townson to consider the part of the Gospels which relates to that subject; but he did not at this time pursue it. In the summer of 1778 he published a sermon, entitled “The Manner of our Saviour’s teaching,” preached before Dr. Porteus at his primary visitation of the see of Chester; and two years after the bishop bestowed on him the archdeaconry of Richmond. The archdeacon of Richmond has a stall in the cathedral of Chester, and his portion in the duties of the church; but in other respects he has really no authority or charge belonging to him; for the bishop is himself, in effect, archdeacon both of Chester and Richmond; the endowments of which two archdeaconries constitute the principal revenue of the see. The bishop, however, laudably solicitous for the good of his diocese, gave him a special commission, April 25, 1782, to visit the five northern deaneries within the archdeaconry of Richmond, in the execution of which Dr. Townson rode, by his own computation, being then almost seventy years of age, 572 miles, and from the information obtained in this journey, composed a very elegant and methodical register, exhibiting a full and distinct view of each parish and r hapelry, under the several heads pointed out for his examination. During the same year, when the attention of the reading and literary world was occupied by the controversy between Dr. Priestley and Dr. Horsley (then archdeacon of St. Alban’s) Dr. Townson sent to the archdeacon some remarks on his opponent’s letters, which were printed in the appendix of Dr. Uorsley’s Letters to Dr. Priestley, published in 1784, but without his name, which he concealed. | In the northern part of the diocese of Chester, the Roman Catholics form a considerable body. This induced our author to turn his mind to examine the claims of the church of Rome, and he accordingly composed a dissertation on the subject; but, although this work was highly approved by his friends, and was even transcribed for the press, he deferred the publication with his wonted diffidence; nor did he at last, when the question was put to him, pronounce decisively whether it should or should not be printed. This, however, Whs done in 1797, and it now forms a part of his esteemed works. In 1784 he printed part of the work on the Resurrection, already noticed as begun in 1778, under the title of “A Discourse on the Evangelical Histories of the Resurrection and first Appearances of our Lord and Saviour Jesus Christ,” 4to. Of this he dispersed six or eight copies among those in whose judgment he placed confidence; but the final publication was posthumous. The above sketch has been taken from the “Account” prefixed by Mr. Churton to “The Works of Dr. Townson,” collected and published by him in 1810, 2 vols. 8vo. The contents of these volumes are: Vol. I. the “Discourses on the Gospels,” to which is subjoined “A Sermon on the manner of our Saviour’s teaching.” The original part of this volume consists of a sermon, entitled “The Quotations in the Old Testament considered,” preached before the university of Oxford, at St. Mary’s Oxford, in 1807, by Mr. Churton, and placed here “in humble hope that it may form no improper introduction to the Discourses of Dr. Townson on the Gospels, by shewing that what is there maintained, in the case of the evangelists, was the known and established practice of revelation, from the days of the first prophets that succeeded Moses.” Prefixed to this excellent discourse, is an introduction of very considerable length, principally in vindication of Dr. Townson from the attack lately made on his work by the author of “| Discursory Considerations on the Hypothesis of Dr. Macknight and others, that St. Luke’s Gospel was the first written.” In handling this controversy, Mr. Churron displays abilities of which it is certainly not too much to say that they place him in the first rank of biblical scholars; but, what is perhaps yet more valuable, they exhibit that uniform candour and calmness of temper, which, if they do not end in conviction, would certainly make many controversies end in peace.